Automated your heating, ventilation and air-conditioning for energy saving and occupant comfort. HVAC (heating, ventilation and air-conditioning) is the largest user of electricity in buildings. It costs a lot to operate and maintain and is critical for delivering comfort for customers and staff. HVAC is vital building infrastructure, yet in the majority of buildings it under performs. Most buildings inherit a piecemeal legacy of HVAC equipment. There is often a range of equipment types, of different makes, models and ages, all with their own way of functioning. As a result the HVAC equipment is also used and controlled in a piecemeal fashion. Temperature controllers are scattered across a building, reliant upon busy staff to operate the best way they can. Building spaces are frequently over-cooled or over-heated. There is no capability to control for energy savings, and with no real-time data management the response to equipment faults is largely reactive, by which time it is more costly and disruptive. When building management systems have been implemented, they have largely functioned as time clocks, scheduling start and stop times and temperature set-points. This is like having a ferrari fitted with a lawnmower engine. Buildings are highly complex operations these days. Many buildings are so complex that it’s not possible to efficiently manage them manually any more. There are many multi-dimensional balancing decisions that need to be made. For instance, their is a sweet spot for maximum efficiency between multiple room temperatures, chiller temperature, airflow rate and external temperature. Not just for one part of the building, but for the entire building all at once, all of the time. Interactions such as this make a considerable difference to electricity costs and building comfort. This just isn’t possible to achieve manually. Until recently, solutions for the intelligent control and automation of HVAC equipment were the domain of large commercial buildings, and were too expensive for most sites. Fortunately, advances in technology has resulted in affordable, intelligent energy management solutions for smaller premises. This provides considerable financial, operating and occupant benefits. Energy Management Systems, also known as Building Automation Systems, deliver smart buildings with efficient energy management. It brings together key building infrastructure such as HVAC equipment, with detailed energy monitoring, external data such as weather bureau feeds, and powerful analytical tools, all integrated into a single platform. The result is a building that uses less energy, is more comfortable for occupants, and is easier to operate. An Energy Management System (EMS) manages the complexity of the energy consumption and systems in your building in a way that allows you to optimise its operation and make sensible business decisions about how you use it. With a good EMS you can make these decisions in real time from anywhere there’s an Internet connection. An EMS isn’t just about the technology; it is an indispensable business tool. An EMS connects, logs and analyses all the key data from electricity, gas and water systems in real time. What it does with that massive amount of real time data is turn it into useful business information so you can make sound decisions. The EMS deals with the complexity of the data internally and presents key information to you in an intuitive format that matches your business needs. A good EMS will connect you with that information anytime, anywhere. It understands how your building should be operating and will let you know if anything isn’t on track. It frees your facilities team from constant monitoring and enables them to spend their valuable time on improving your building’s performance. Ten years ago, Building Management Systems (BMS) and SCADA were the tools that gathered together utility data and managed building systems. However BMS and SCADA systems were never designed to handle the increasing complexity of multi system optimisation and the extremely high volume of data involved. They can quickly reach capacity and upgrades often involve expensive hardware and additional software licenses. EMS’ are the next generation technology designed specifically for this purpose. They utilise advances in computational processing power, big data analytics and intelligent algorithms. A good EMS will also enable you to scale in a flexible and open manner without proprietary system (vendor) lock-in. You choose what system you want to add, how you want to add it and what you want to do with the data. Automated, real-time adjustment of temperature set-points can reduce electricity usage by 10% for every 1° of unnecessary cooling that is avoided and 15% for every 1° of unecessary heating that is avoided. Electricity companies charge you for the maximum demand you use. Automatically adjusting your HVAC in response to real-time usage and demand threshold levels can significantly reduce these charges on your electricity bill. If tomorrow is forecast to be a hot day, a building automation system can automatically pre-cool the building in advance to take advantage of off-peak energy costs and reduce consumption and demand during peak periods. Ensures that the building trajectory (when heating/ cooling starts, how fast it operates, what temperature trajectory it tracks through) is efficient and cost-effective. 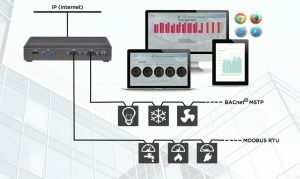 The automated functionality, in response to a range of variables, takes the pressure off busy building managers to continuously interpret data and manually intervene in the settings of HVAC equipment. The EMS optimises complex systems within your building. You won’t even know these potential savings exist without digging into the data very deeply. They’re not the sort of thing you can see walking through a plant room – they’re hidden away in the complexity of the data and the unseen interactions taking place within your building. Over-cooling and over-heating of building spaces is common, and it is uncomfortable. Building Automation keeps all HVAC equipment across a building in sync and adjusts equipment operation to achieve targetted temperature levels. People feel comfortable at different temperature levels depending on the season and the outside temperature. Building automation takes this into account, making slight changes to internal temperature to optimise comfort, and reduce energy usage . Over time, most buildings become less efficient as operations change and equipment performance degrades. Monitoring and analysing the performance of your equipment enables your building to maintain efficient operation. A diagnostic function is performed with complex engineering algorithms for most HVAC components. Errors or drifts from typical operating parameters – indicating that a component is starting to fail – are detected, and operators alerted via alarms to enable preventative maintenance. By reducing the ongoing cost of running your building, you drive up its asset value and find it easier to find good tenants. A recent Investment Property Databank report found that a high NABERS office building in an Australian CBD had a 3.1% higher annual growth in capital value than a low NABERS rated building. They also found that buildings with higher ratings are not only lower cost to run for tenants, but they also generate higher basic rent, higher net operating income, lower capital expenditure, lower vacancy rate, and longer weighted average lease expiry. Like any highly complex interdependent system, buildings “drift” over time. That is, they invariably move away from the original optimised efficiency settings from when they were commissioned. The Lawrence Berkeley National Laboratory has found that building drift of 10 to 30% in the first two years of operation is common. An EMS ensures that your building energy systems are maintained at optimum efficiency in real time, all the time. Powerful reporting with information that helps building managers make insightful decisions. 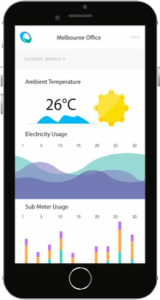 Measure the energy saving outcomes of HVAC adjustments and site changes. Baseline your buildings energy performance and monitor and report against this. Buildings and operations can be maintained efficiently and transparently. An effectively deployed EMS allows you to treat energy and utility costs like any other essential business input. You can assign responsibility, set targets and measure performance against those targets just as you would any other input to your business, and you can do it without massive overhead or reliance upon expensive consultants. Please contact us to discuss if an Energy Management System may be suitable for your building.